In 2005, the Government of India launched the National Rural Health Mission (NRHM), promising to re-imagine primary healthcare and address the under-served needs of rural areas. The thrust of the mission was to establish a fully functional, community owned, decentralised health delivery system with inter-sectoral convergence that ensured parallel improvements in areas that impact health outcomes – such as water, sanitation, education, nutrition, and social and gender equality. It subsequently published the Indian Public Health Standards (IPHS) as a reference point for public healthcare infrastructure planning and upgrade of existing facilities. In May 2013, the Manmohan Singh Cabinet approved the framework, with Rural Health and Urban Health Missions as the two sub-Missions of the over-arching National Health Mission (NHM). Complementing NHM at the secondary and tertiary level care is the Rashtriya Swasthya Bima Yojana (RSBY) at the national level, and a number of state-level government health insurance initiatives. However, many big states like Uttar Pradesh do not implement RSBY, and the overall budget for such schemes remains limited. They often offer light financial protection and narrow coverage. By the time the government established the NRHM, it had also made international commitments to achieve the Millennium Development Goals (MDGs). In fact, the 11th Plan laid out goals and targets that were more ambitious than the MDGs. In 2015, the government ratified the Sustainable Development Goals (SDGs), committing itself to the inclusive and universal development of people and planets through cross-sectoral collaboration for equitable prosperity. Unlike the MDGs, the 17 SDGs and 169 targets announced at the UN General Assembly 2015 were developed by the countries themselves and aim to stimulate action over the next 15 years. Ensuring Universal Health Coverage for all citizens was seen as a critical strategy to achieve the SDGs. The 12th five year plan, Niti Aayog’s Three Year Action Agenda, as well as the National Health Policy 2017 have health targets well in line with the ambitious SDG targets. The Lancet Commission findings for India revealed that a $1-investment in health would yield a $10-increase in gross domestic product (GDP) by 2035. 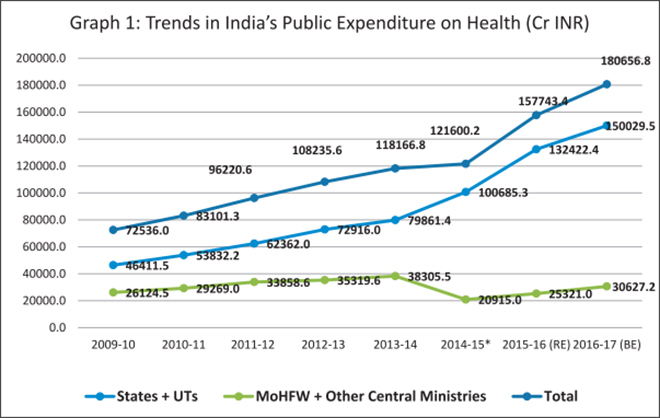 Over the last eight years for which detailed official data are available, India’s health spending has gone up considerably, as Graph 1 shows. The seemingly sudden decline in the Centre’s share in 2014-15 is due to a change in statistical method – from that year, transfers to states through the treasury route were taken as part of state expenditure. The recent devolution and the changes in the structure of fund flows in the health sector (Box 1) have increased the proportion of money spent on health by the states. However, the increase in public spending on health – when considered as a percentage of GDP – remains more conservative, increasing over the last decade from 1.1 percent of GDP to 1.4 percent. India has a federal structure of government, wherein a number of schemes in various sectors (including the health sector) are initiated at the national level and implemented at the subnational level. Till March 2014, the bulk of funds for these schemes were released by the central government directly to implementing agencies without involving the treasuries of the state governments. After March 2014, these funds have been released to the treasuries of the state governments, which in turn release them to state-level implementing agencies. The state-level implementing agencies further release funds to district-level, block-level and lower level implementing units. Public funds therefore, have to flow through multiple levels of governments and administrative units before these can be spent on the designated goods and services. Despite the recent successes in disease elimination and the largest ever decadal decrease in neonatal, infant and maternal mortality, a large section of the Indian population still has limited access to quality healthcare. The newly released disease burden estimates underscore the health challenges faced by the Indian people. Life expectancy at birth improved in India from 59.7 years in 1990 to 70.3 years in 2016 for females, and from 58.3 years to 66.9 years for males. State statistics however showed inequalities, with a range of 66.8 years in Uttar Pradesh to 78.7 years in Kerala for females, and from 63.6 years in Assam to 73.8 years in Kerala for males in 2016. While the per person disease burden measured as the disability-adjusted life years (DALYs) rate dropped by 36 percent from 1990 to 2016 in India, there was an almost two-fold difference in this rate between states in 2016. Amongst the states, Assam, Uttar Pradesh and Chhattisgarh had the highest rates, and Kerala and Goa the lowest. For India as a whole, the DALY rate for diarrhoeal diseases, iron-deficiency anaemia, and tuberculosis was 2.5 to 3.5 times higher than the average for other geographies at a similar level of development, indicating that this burden can be brought down substantially. The most important health system issue emerging out of the latest disease burden statistics is the considerable shift from infectious and maternal/child health conditions to non-communicable disease (NCD) conditions across states. India’s public health delivery system is still geared towards infectious diseases as well as maternal/child health conditions. There is very little in the existing structure to address emerging concerns like non-communicable disease conditions or mental health. If drastic changes are not made followed by sufficient funding, these emerging challenges will soon blindside India’s economic growth story. Primary health services remain extremely inequitable within the country, both in terms of access and delivery. For example, according to data from 2017 calculated using the prescribed norms on the basis of rural population from Census 2011, Andhra Pradesh has a primary health centre (PHC) shortfall of four percent, Uttar Pradesh of 30 percent, Bihar of 39 percent and Madhya Pradesh of 41 percent. Overall, the country still has a 19 percent shortfall of sub-centres, 22 percent shortfall of PHCs, and a 30 percent shortfall on community health centres (CHCs). 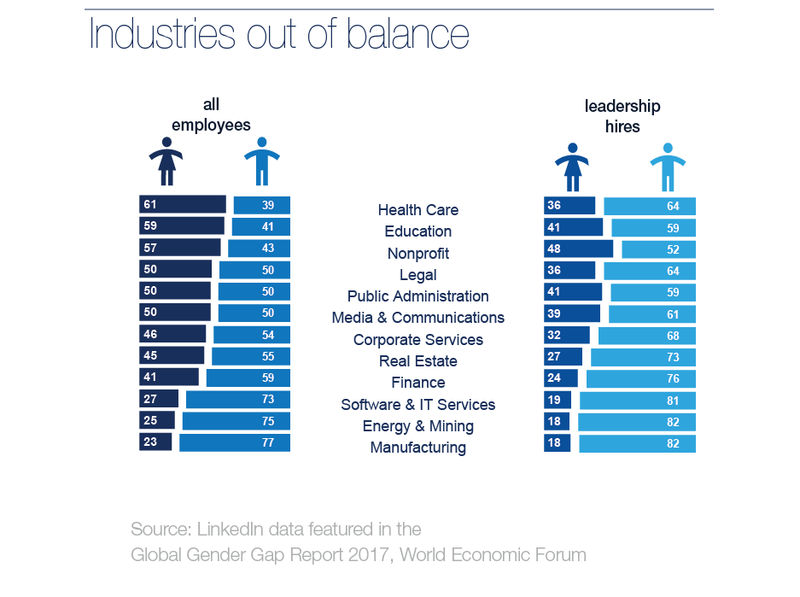 Access and delivery problems are compounded by severe human resource constraints. Challenges prevail in three aspects of human resources for health: numbers, distribution, and skills. In terms of numbers, the country faces a shortage of physicians and specialists, with a doctor-patient ratio of 0.7 per 1,000. 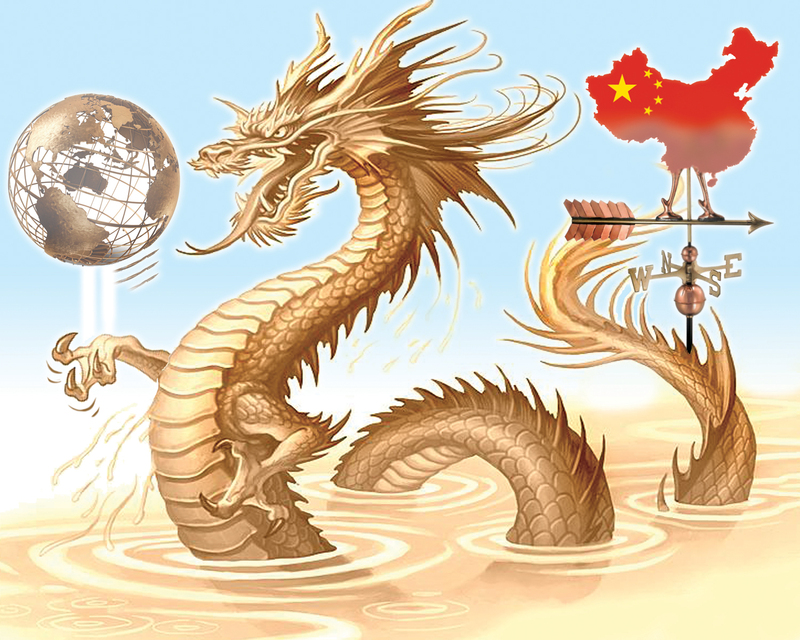 This is significantly lower than the global average of 1.4, as well as that of several other developing countries and emerging economies, including Brazil (1.9), Turkey (1.7) and China (1.5). In March 2017, nearly eight percent of PHCs in India had no doctor and 18 percent were unsupported by pharmacists. While the National Health Policy (NHP) and its main implementation arm, the NHM, outline an ambitious vision, India’s investment is healthcare remains low. The majority of the population continue to bear the brunt of healthcare costs with limited accessibility to quality health services. Indeed, despite a rapidly growing economy, government expenditure on health has seen no significant increase for a decade (2005-2014). 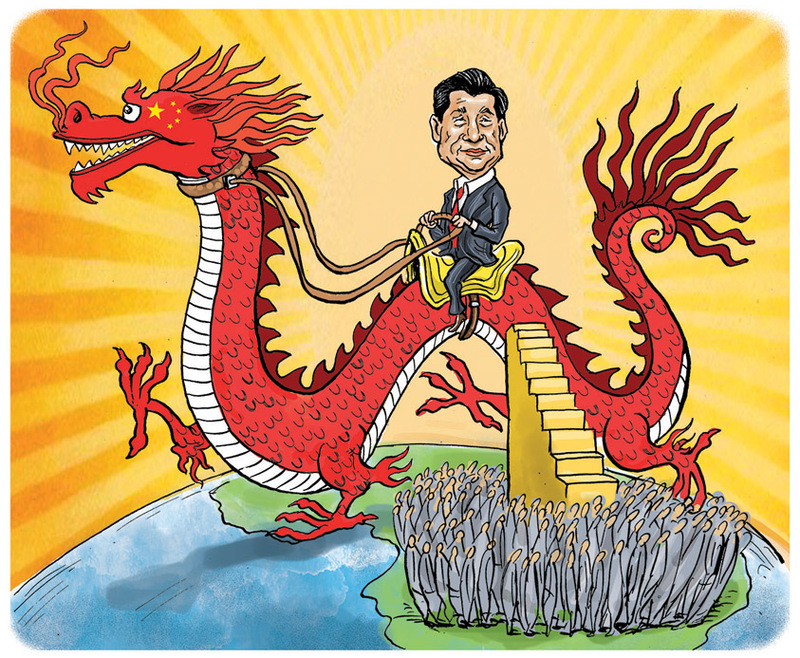 It hovers between 1.1–1.4 percent of GDP, significantly lower than that of Nepal (2.3 percent), Bhutan (2.6 percent) and Sri Lanka (two percent), and shamefully lower than the global average of six percent. While the NHP talks about an increase to 2.5 percent by 2025, there is no clarity on how much the increase will be on an annual basis. The 2.5 percent allocation is despite the increase to three percent of GDP by 2022 recommended by the High-Level Expert Group (HLEG) on UHC set up in October 2010 under the auspices of the previous Planning Commission, and takes no cognisance of a study conducted by Ernst & Young which estimated that government expenditure on health will need to account for 3.75-4.5 percent of GDP by 2022. As a result of the low priority given to public healthcare spending, Indians on average have a very high burden of out of pocket (OOP) expenditure on health (Graph 2). The poor availability and quality of public health services is forcing people to seek care in the private sector. In India, the private sector provides more than 80 percent of outpatient care and 60 percent of inpatient care. With no widespread financial protection scheme in place, private spending on healthcare negatively impacts the financial stability of millions of Indians every year. Latest research using National Sample Survey Office (NSSO) data from 2014 found that the percentage of Indian households that fell below the poverty line due to OOP health expenditure was seven per cent of the total; this is a massive number. OOP expenditure remains alarmingly high at 62.4 percent, as already discussed. Based on NSSO 2014 data, of all health expenditure, 72 percent in rural and 68 percent in urban areas was on buying medicines for non-hospitalised treatment. Against this backdrop, Global Health Strategies (GHS), in partnership with the International Vaccine Access Centre (IVAC), Johns Hopkins Bloomberg School of Public Health, and the IKP Trust, undertook a study to evaluate public financing mechanisms capable of sustainably delivering UHC in India. The key recommendations of the study were that India urgently needs to re-examine both the provisioning and financing of healthcare. In terms of provisioning, the government should aim to universalise free primary healthcare at the point of service. This will ease the load on the secondary and tertiary care centres. To finance this provision, a higher proportion of GDP will need to be allocated from tax revenues. There should be a national social health insurance (SHI) covering secondary and tertiary care for the entire population. Additionally, supplementary taxes such as sector-specific taxes, so-called ‘sin’ taxes, corporate social responsibility (CSR) contributions, tax-free bonds and trust funds could also be explored for specific health interventions over short periods of time. The GHS study report was drawn up through literature review, interviews with experts and a high-level, national consultative meeting. This Special Report builds on the findings of the study and presents recommendations for a policy audience. Nobel laureate Kenneth Arrow had laid down the reasons why healthcare cannot be treated simply like any other commodity, to be sold and bought at prices determined solely by market forces. His argument was that the very unpredictability of health needs and expenses makes people less likely to provide for future health expenses than, say, for future housing or clothing needs—a phenomenon that he called ‘hyperbolic discounting’. A healthy person tends to think that health lasts forever. Access to health information is limited, making the patient dependent on doctors for crucial decisions about treatment and that too at a time when s/he is physically and mentally vulnerable and extremely easy to exploit. Trust is therefore the most important component of the doctor-patient relationship. Unpredictability of health outcomes, and the fact that patients are billed once a non-refundable service has been delivered, means that it is not possible to shop for health services the same way as one would shop for, say, toothpaste. There is also a demand-supply gap: the number of doctors available is limited; years of study and a licence to practice medicine are entry level barriers and justifiably so. That again makes it different from shopping for toothpaste because, in theory at least, there is no limit to the number of companies that can manufacture toothpaste. International examples bear out Arrow’s argument that governments need to be the actively involved in healthcare, as it is not a standard market good. In Japan, for example, 82 percent of all health expenditure is publicly funded. The Organisation for Economic Co-operation and Development (OECD) countries’ average is 72 percent. Japan has a mandatory health insurance scheme, with premiums based on the socio-economic status of beneficiaries. Healthcare in Sweden is primarily funded by the government, which raises money through taxes. At 11.9 percent of GDP, the Swedish government’s spending on healthcare is one of the highest in Europe. International precedents show that when public spending on healthcare rises to around six percent of GDP (the global average for UHC systems) OOP payments fall below 20 percent of total health expenditure. In India, the over-reliance on a largely unregulated private sector is fraught with risks of unnecessary costly interventions being chosen over more cost-effective options. That this is already happening is clear from National Family Health Survey 2015-16 (NFHS-4) data that shows that approximately twice the number of babies are delivered by Caesarean section (C-sec) in the private sector as compared to the public sector. While World Health Organization (WHO) guidelines suggest that C-sec should be prescribed within the range of 10-15 percent of total births, private sector rates range from 87.1 percent of deliveries in urban Tripura (compared to 36.4 percent in the public sector) to 25.3 percent in urban Haryana (compared to 10.7 percent in the public sector). WHO also says that while C-secs can reduce chances of maternal and child mortality, there is no evidence of any extra benefits if the rate rises above 10 percent in a population. The quality of care in the private sector is not always up to standards prescribed by Indian Public Health Standards (IPHS). A study in rural Madhya Pradesh found that only 11 percent of the sampled health-care providers had a medical degree, and only 53 percent of providers had completed high school. Thriving quackery, not just in rural areas but also in urban pockets, is an open secret. Recent examples from Delhi private hospitals show that high-end, expensive hospitals can also have uninterested and callous administrations, thus not necessarily providing quality care to paying patients. Big hospitals may not be available near most rural or low-income communities, being concentrated mostly in urban areas where people have the capacity to pay high amounts. However, what keeps the private sector hospitals – which are a highly differentiated set in terms of size, quality and cost – receiving the bulk of the patient load is that they are available round the clock, at close proximity to the community. This is not to say all private sector hospitals are bad and should be done away with. They have an important role to play in a country with a large population and limited government intervention. The problem is an over-reliance on the largely unregulated private sector where payments are mostly out-of-pocket and high. This can and does result in negative conditions of over-treatment, poor quality, selective care, and cost escalations. Health is a state subject. Yet it is the Centre that is the prime mover behind the National Health Mission, which is a core central scheme. Despite the focus on healthcare in the Budget 2018, the actual allocation for NHM decreased from INR 31,292crore in 2017-18 (revised estimate) crore to INR 30,634 crore (budget estimates) in 2018-19. This is a decline of about two percent from the revised estimates of 2017-18. In addition to the inadequacy of funds, the inconsistency in the timing of funds released by the Centre to state governments has contributed to inequity in terms of service delivery across the country. On average, there were more unutilised funds at the end of the year in the states that needed them most. A 2017 study by the influential National Institute of Public Finance and Policy (NIPFP) and WHO India on utilisation, fund flows and public financial management under the NHM found that at the state level, a file with a request for release of funds has to cross a minimum of 32 desks while going up the administrative hierarchy, and 25 desks on the way down. The study recommended streamlining processes to ease the rigidities of the state treasury system. It is believed that strengthening health systems will increase the states’ capacity to absorb increased allocations, and should be prioritised, particularly in high-burden states and districts. Poor absorption and distribution of funding at the state level leads to an accumulation of unspent resources each year. This lack of absorptive capacity at the state level has been used both as a justification for the Centre’s non-release of funds, as well as an argument for decreasing overall funding for healthcare. A study by Harvard University in 2017 on state-level, primary-level expenditure trends found that among the 16 states studied, some poorer states have already started focusing on primary care, and that states like Chhattisgarh, Rajasthan and Assam spend more on it in per-capita terms than better-off states like Kerala or Gujarat. However, the study also found that the primary care expenditure as a percentage of total government health expenditure has either plateaued, or shown a downward trajectory for the last three to four years in 11 out of the 16 states. It is well established that a functioning primary-level care delivery system can take considerable patient load off the secondary and tertiary hospitals. There are yawning gaps in the existing primary care network with some states being far better organised than others. Addressing the infrastructural and human resource gaps in primary care will go a long way in addressing overcrowding in urban hospitals, as well as controlling household costs. The private sector’s focus on costly tertiary interventions rather than primary prevention has given rise to a situation where the limited number of doctors available crowd these better paying centres while there are few doctors to be found for primary care. This pushes people to seek treatment at the tertiary centres. Investment in primary care therefore has benefits at multiple levels: prevention, gate keeping, and putting an end to the crowding at tertiary care centres whether public or private. Medical education in India is currently geared towards producing specialists rather than family physicians who are the bedrock of primary care. Every year 60,645 medical graduates qualify to be part of the public health system but opt out of it for a variety of reasons – poor pay, remote locations, and lack of facilities. Across the world, countries have tried to contend with this problem in their own way, but for India, perhaps, the best option could be for the government to train non-physician medical providers like nursing practitioners (with BSc Nursing degrees), Ayurvedic practitioners (with Bachelor of Ayurvedic Medicine and Surgery degrees), and Dentists (with Bachelor of Dental Surgery degrees), all of whom would require additional training and formal certification in allopathic primary care. The Supreme Court, in its ‘Dr. Mukhtiar Chand & Others Versus the State of Punjab’ judgment in 1998, acquiesced in legal feasibility of such an approach, specifically for BAMS doctors, who are in adequate supply. In this vein, the National Medical Commission Bill, 2017, has suggested a bridge course to enable practitioners of Ayurveda, Yoga and Naturopathy, Unani, Siddha and Homeopathic (AYUSH) systems to practice modern medicine, despite widespread protests from professional associations. Given the limited MBBS output, the best solution here too may be focused training of MBBS doctors, rather than looking at the long-term option of increasing post-graduate seats in medicine. Every dollar spent on vaccines in low-income countries yields a $16 return in direct costs and a $44 return in indirect costs within a decade. It is one of the most cost-effective options of preventive health. India has its own vaccine success stories. It followed up its 2014 achievement of polio-free certification, with the elimination of maternal and neonatal tetanus in 2015. It owes both these achievements to a concerted immunisation effort. However, children in India continue to die of vaccine-preventable diseases. It has the largest number of under-five deaths in the world, at 1.2 million, comprising 20 percent of the global total. India’s share of pneumococcal, rotavirus and measles deaths is 25.6 percent of the global toll. India’s per capita immunisation spend is just $8.88, far less than Bangladesh ($34.61), Nepal ($29.96), China ($22.09) and Pakistan ($13.14). It was among the last four countries to approve Haemophilus influenza type B (Hib) vaccine to prevent pneumonia, along with Indonesia, Belarus and South Sudan, and it has only recently introduced the vaccine in its immunisation programme. Recent data shows that India’s performance in ensuring immunisation coverage has been slow, with worrying reversals in some key states. Research by Observer Research Foundation has shown that prior to the NRHM, full immunisation coverage in India improved at a sluggish pace from 35.4 percent in 1992-93 to 42 percent in 1998-99 and 44 percent in 2005-06. NFHS-4 found that immunisation coverage had increased to 62 percent in 2015-16. Although post-NRHM, the pace of immunisation has accelerated, the improvement is far less than, for instance, in the case of institutional births (births taking place in a medical institution rather than at home) which grew from 39 percent in 2005-06 to 79 percent in 2015-16. 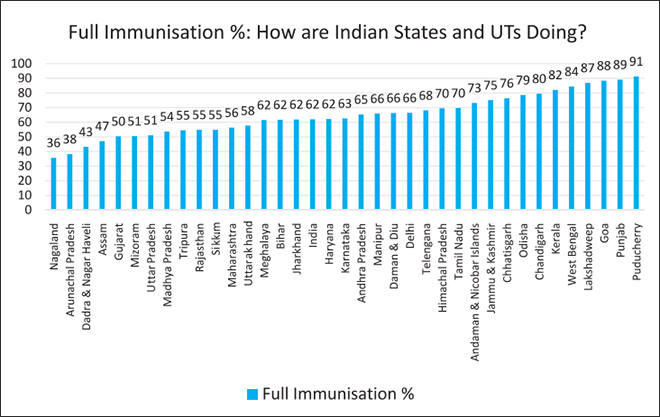 The following graph shows the current levels of full immunisation coverage across Indian states and UTs. In the last few years, there have been many additions to the Universal Immunisation Programme (UIP), and Mission Indradhanush – introduced in 2014 – which aims to fully inoculate all children under the age of two with seven essential vaccines by 2020. Pneumococcal Conjugate vaccine (PCV) was introduced in 2017; Inactivated Polio Vaccine (IPV) has been rolled out nationally; rotavirus vaccine is available in nine states, and Japanese Encephalitis (JE) vaccine in all priority districts. However, the projected cost of these vaccines will have to be taken into account as India increases allocation to healthcare as it has committed to do in the NHP. The procurement cost for these life-saving UIP vaccines is expected to go up 6.5 times, from $88 million to $565 million for complete scale-up of Pneumococcal Conjugate Vaccine (PCV), Rotavirus, Measles Rubella (MR), Inactivated polio vaccine (IPV) and Pentavalent vaccines as per the comprehensive multi-year strategic plans (cMYP) costing and financing tool for immunization. With a forecasted budget increase from $694 million to $1.44 billion, the funding gap for UIP is set to rise to 37 percent of total programme costs, or $534 million. For now, the Global Alliance for Vaccines and Immunisation (GAVI) has contributed $500 million but it is targeted only at poor countries; and as India graduates to middle-income country status by 2021, it will no longer be eligible for GAVI support. Sustainable domestic funding options will have to be explored. India has historically never rolled back a vaccine once it was introduced in the UIP. At a high level national consultative meeting organized by GHS, a panel of experts recognised that maternal and child health have to be seen as an investment rather than expenditure and the most cost-effective intervention, vaccination, is a priority investment for the nation’s future. It should also therefore be classified as capital expenditure rather than revenue expenditure. In most countries in the world that have managed to implement UHC, the bulk of the funding comes from general government revenues (tax financing) and public contributions towards a social health insurance programme. In India, general tax revenue is the source of 90 percent of public health funding, but the low tax to GDP ratio (17.7 percent) is the spoiler. However, countries with lower GDP growth and economic potential than India have done it. Mexico moved towards UHC by increasing public spending on health from 1.9 percent in 1996 to 3.25 percent of GDP in 2014. Thailand doubled its public expenditure on healthcare from 1.66 percent in 1995 to 3.2 percent of GDP in 2014. Both countries have a tax to GDP ratio almost identical to India’s, although both are much richer. While increased allocations from the general tax pool could help finance primary healthcare, supplementary resources will be required to fund secondary and tertiary healthcare. No examples of a universal healthcare system funded purely by general taxation exist anywhere in the world. Even the National Health Service (NHS) in the UK is funded by a combination of general taxation (around 80 percent) and national insurance contributions (close to 20 percent). The UK’s tax to GDP ratio is around double that of India’s but public funding on health is more than five times (as a percentage of GDP). That is why a mandatory social health insurance may be a good option; however the relatively small size of India’s organised sector may prove a roadblock. The effort should be to pool the already large OOP expenditure on health into pre-payment pools and enable users to spread the expenditure over a longer time-frame by pooling of risks. Statutory health insurance (SHI) schemes function by mandating payroll contributions from workers, pooling the resources collected, and earmarking them for a comprehensive health benefits package for all. Risk pooling is a mechanism by which revenues are aggregated to spread financial risk of health expenditures across individuals and over time. Pooled revenues are used to pay for healthcare needs of individuals, reducing or eliminating the need for OOP expenditure at the point and time of service. It is also essential for a universal care package to be clearly defined and to include outpatient services, cost of medicines and a continuum of care feature. Mandatory health insurance contribution may have political implications in a cost-sensitive society like India. However, if the resources raised by the government are effectively earmarked for healthcare, the willingness of the middle and higher income-groups to contribute will be higher since their expenses would then amount to an investment with a clear return. There are some existing insurance schemes like the Employees’ State Insurance Scheme (ESIS) for factory workers and the RSBY for the informal sector workers, which are now being planned to serve as blueprints for wider health protection schemes. In the Indian context, a national social health insurance scheme should cover the entire population, where the government pays for the poor and vulnerable, the formal sector pays through mandatory payroll contribution, and innovative mechanisms are explored to charge fees from the informal sector. The current UHC plan of the government seems to be around National Health Protection Scheme (NHPS), which is an enhanced version of the RSBY. Nearly 22 percent of Indians live below the national poverty line, and the poorest 40 percent have access to only 20 percent of total income. Reaching these sections will involve substantial administrative costs. Community outreach may be an important first step before moving on to more sophisticated tools to decide eligibility. In 2012, both Turkey and Indonesia replaced community targeting based on local expertise, with rigorous registry through a clearly defined methodology, with increased and more equitable enrolment success. The Philippines also initially used community-based targeting where local governments identified beneficiaries, enrolling millions of people identified as poor in a health insurance scheme financed by the central government. But in 2009, the central government imposed a more rigorous methodology through the National Household Targeting System. The new system revealed that only 800,000 of the beneficiaries qualified as poor and were thus eligible for subsidies, and that many households that were poor had not been enrolled in the subsidised health insurance programme. Given such inclusion and exclusion errors, any such mechanism should have the required flexibility and consider the households that fall into poverty every year due to health related expenses. What kind of money can mandatory payroll contributions generate? An early estimate based on income-tax collections in 2014-15 of INR 284,266 crore (PPP $160 billion), shows that between INR 14,000 to INR 34,000 crore (PPP $7.7 billion to $18.9 billion) could be raised, with contributions ranging from 5-12 percent. This figure would provide a significant contribution to the NHP target of 2.5 percent of GDP for universal coverage, equivalent to 25 percent of the current shortfall in spending. Reaching informal sector workers may prove to be the real roadblock for India in rolling out an SHI. The informal sector employs 91 percent of the workforce in India. 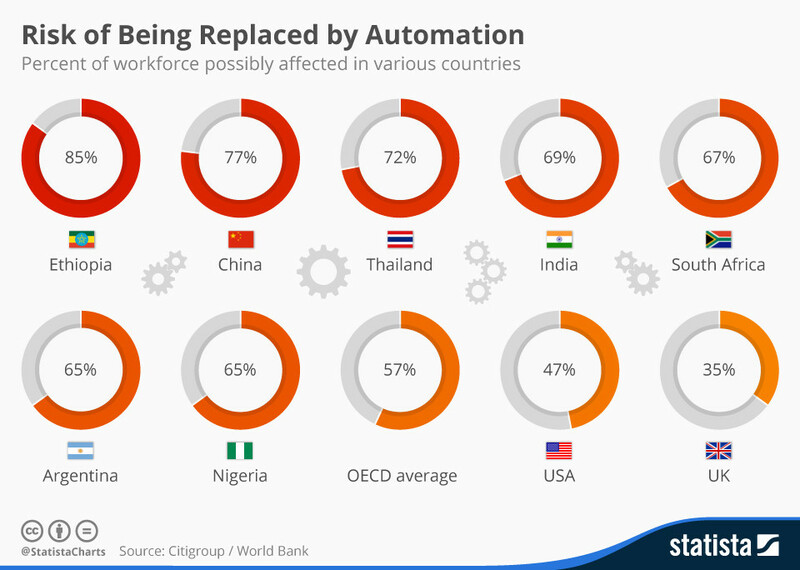 However, countries like Vietnam (68.2 percent in the informal sector) and Thailand (42.3 percent) can serve as models. Vietnam uses tax funding to reduce the premium for the informal sector by 50 percent, while Turkey employs a sophisticated system to determine appropriate premium payments for informal sector workers through scoring estimated income, property value and car cost. Multiple governments, including those of Colombia, Mexico and Thailand, originally charged the informal sector for participating in health insurance schemes, but have since extended full subsidies to these populations. For India, the platform of Jan Dhan, Aadhaar and extensive use of mobiles could provide the building blocks for identifying and enrolling the target population. General tax revenues and SHIs can be supplemented by sector specific taxes. The erstwhile education cess, for example, was instituted to fund the government’s Right to Education (RTE) obligations; the National Clean Energy Fund was set up to tax INR 200 per tonne of coal imported or produced in India. There is also the Central Road Fund since 2000, to improve road infrastructure, which taxes petrol and diesel, and which was increased in 2015 from INR 2 per litre to INR 6. The existing 3 percent education cess on personal income and corporation tax was converted into a 4 percent “health and education cess” by Budget 2018 to fund the initiatives for families in rural areas and those below the poverty line. The increased cess is expected to collect an additional ₹11,000 crores per year, and be a main source of funding for the proposed National Health Protection Scheme (NHPS). The education cess had increased total allocation for elementary education from INR 5,000 to INR41, 000 crore between 2004 and 2013. Another source of funding could be “sin” taxes, a concept that currently applies to tobacco and alcohol in India, though such taxes are not a sustainable long-term source. . A tax on aerated sugary drinks and junk food can be considered, with the added advantage of thereby reducing their consumption and impacting NCDs in the process. The CSR contributions of the private sector too could be harnessed for health purposes. Section 135 of the Companies Act 2013 made India the first country in the world to legislate for mandatory CSR contributions. All companies with a net worth above INR500 crore, or a turnover above INR 1000 crore or an annual net profit of above INR 5 crore are required to spend 2 percent of their net profit on CSR related activities. The Act lists a series of legitimate recipients of CSR contributions, including campaigns such as reducing child mortality and improving maternal health. The scheme stands to raise a significant amount of money for development projects. In the first year of implementation in 2014-15, Indian companies paid out around INR 6,400 crore in CSR payments. Reliance Industries Ltd was the top contributor, funding approximately INR 761 crore of the total collection, followed by the state-run Oil and Natural Gas Corporation Ltd with INR 495.2 crore. However, in 2015, KPMG found that more than half the 100 largest Indian companies had failed to meet their targets. CSR contributions, along with funding by the government, could possibly help strengthen the primary care network. Tax free bonds and trust funds too could generate some funds, though CSR may be the most promising option. Budget 2018 with the proposed Ayushman Bharat initiative is a landmark moment in India’s healthcare policy. After the launch of NRHM, it is perhaps for the first time that health is getting such attention in the union budget. However, despite the ambitious beginning, NRHM (now NHM) failed to improve the primary healthcare infrastructure in any substantial way. GHS (2018) found that more than 80 percent of the increased service provision under the NHM was attributed to just 20 percent of health facilities. In 2017, only 11 percent sub-centres, 16 percent primary health centres (PHCs), and 16 percent community health centres (CHCs) were found to be functioning as per Indian Public Health Standards (IPHS) norms. The ambitious National Health Protection Scheme (NHPS), which promises to expand insurance cover from current low levels to a substantial 100 million households is expected to improve access to secondary and tertiary healthcare tremendously. Building on the gains of the past decade, India continues to follow a two-pronged strategy of demand side as well as supply side interventions in healthcare. The Empowered Programme Committee of NHM approved ₹1,200 crore for 2018-19, and ₹1,600 crore for 2019-20 for setting up 1.5 lakh health and wellness centres. This means that the sub-centres, the lowest rung of the NHM structure, will for the first time, move beyond providing antenatal and postnatal care, and immunization services. The Finance minister in his budget speech confirmed this commitment this year. If implemented well, this initiative will take comprehensive primary healthcare services closer to the people who need them the most. It also has the added benefit of taking some burden off the secondary and tertiary care delivery system. However, per sub centre, current year’s allocation translates to only ₹80,000, which may prove to be inadequate given the ambitious objectives. The Budget 2018 makes it clear that India’s medium-term pathway to UHC is a continuation of the last decade’s strategy of provisioning-insurance mix at an expanded scale. It will be key how the government addresses the severe health workforce shortages in the public hospitals so that part of the huge insurance bonanza (amounting to INR 15000 Crores) flows back into the public healthcare delivery system and rejuvenates it. It is expected that the proposed merger of three unlisted public sector general insurance companies will help keep the insurance premium within NHPS substantially low compared to RSBY. The rapid expansion of the insurance coverage is also expected to kick in economies of scale and help keep costs low. Yet, offering a substantial health insurance cover of INR 500,000 for 100 million households with the available resources will be a big challenge within the current cost parameters. Increase in government investment in healthcare is the most preferred option on the road to universal health coverage. This is not just because it has the highest benefit to cost ratio, but also because increased public sector investments would better enable a significant section of the population to access improved healthcare. This would also enable emerging lower middle-class groups that demand better healthcare but find the rates in the private sector unaffordable. However, apart from looking at increasing the spending on health, India also needs to look at more efficient means of spending that money. This can be achieved by prioritising high impact system design changes and interventions like immunisation which give the biggest impact for every rupee spent. The focus has to be on improved, accessible and quality primary care. To chalk out the implementation blueprint, a committee of diverse stakeholders and policy makers needs to be established to further evaluate these recommendations and use them to develop implementable guidelines. Given the potential of rapid expansion of fiscal space, it should be possible for India to eventually bring in the remaining 150 million households into a truly universal system, which integrates NHPS with the primary healthcare delivery system in the medium run. How a diverse India choses to do it will offer lessons to dozens of other countries who plan to make UHC a national mandate and expand health coverage to yet uncovered population groups. Anjali Nayyar is Executive Vice President, Global Health Strategies. Dhruv Pahwa is Senior Director, Global Health Strategies. Samir Saran is Vice President, Observer Research Foundation. Oommen C. Kurian is Fellow, Observer Research Foundation. Patel et al. 2015. Assuring Health Coverage for All in India. The Lancet 386: 2422-35. Liu L, Oza S, Hogan D, et al. Global, regional, and national causes of under-5 mortality in 2000-15: An updated systematic analysis with implications for the Sustainable Development Goals. Lancet 2016.